WinExpand is known to be an advertising-supported application. It means that WinExpand only shows various commercial advertisements on your screen and does not do anything really beneficial even though the information on its official website informs users that WinExpand will act beneficially and will even help to save some money. Research carried out by the specialists working at pcthreat.com has shown that WinExpand usually appears on computers of those users who live in Korea. Therefore, we believe that WinExpand is a Korean adware. Of course, we cannot guarantee that it will not enter your PC if your place of residence is different. Has this already happened? If so, you should delete WinExpand as soon as possible even if it looks like a harmless application at first sight. Specialists say that you should not keep adware on board because these programs might simply redirect to unreliable web pages and thus might cause harm to your system. It is very likely that you will not be able to use your PC freely if you keep this adware installed on the system because it will constantly bombard you with advertisements. It has been noticed that these ads are very prevalent on online shopping websites – they might be related with the product user is watching. Even though ads generated by WinExpand usually advertise different products and services, we do not recommend clicking on any of them because you might be redirected to unreliable web pages. Actually, the presence of ads is not the only reason why you should get rid of adware. Specialists say that it would be best to remove WinExpand from the system also because this program might collect information about your Internet browsing habits. It does that for one main reason – to provide users with relevant advertisements. As you have probably understood, WinExpand seeks to convince users to click on ads. It is likely that the publisher of WinExpand receives money for driving traffic to different websites. WinExpand usually travels in a bundle with other programs, so Korean users usually do not notice that an adware program has entered their systems. 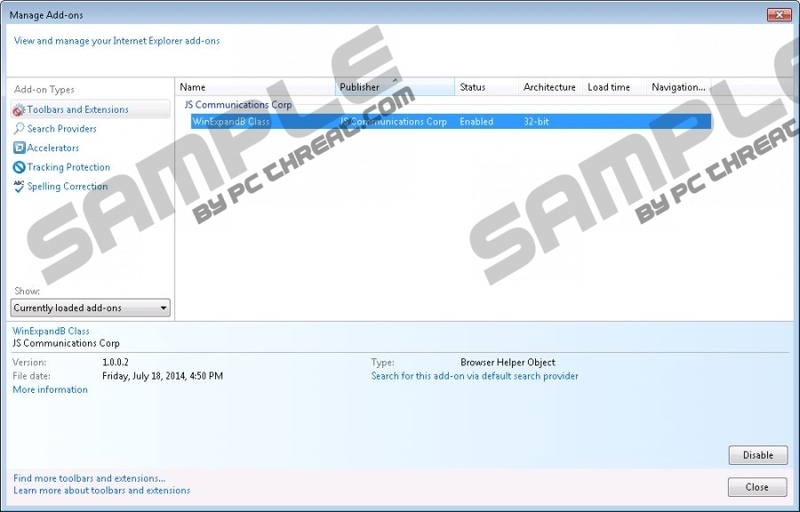 You might have downloaded WinExpand from a third-party web page or its official website too. Either way, make sure that you erase this adware program from your system as soon as possible. As it might have entered your system with other untrustworthy programs, you must scan your system with an antimalware tool to detect them and then erase them all from the system. Use the SpyHunter antimalware tool for this matter. Specialists have noticed that WinExpand has an uninstall in Control Panel, which means that you will be able to delete it like any other program. If you have never tried erasing any applications, you can use an antimalware tool. There is no doubt that you have to scan your system with an automatic scanner if advertisements have not stopped appearing on your screen after the manual WinExpand removal. Such a tool will erase other undesirable programs that might be responsible for advertisements too. Right-click on WinExpand and click Uninstall. Quick & tested solution for WinExpand removal.